Unroll pizza dough onto cutting board; cut into 24 equal pieces. Reserve half the dough for later use. Press remaining dough pieces onto bottom and up sides of 12 muffin pan cups sprayed with cooking spray. 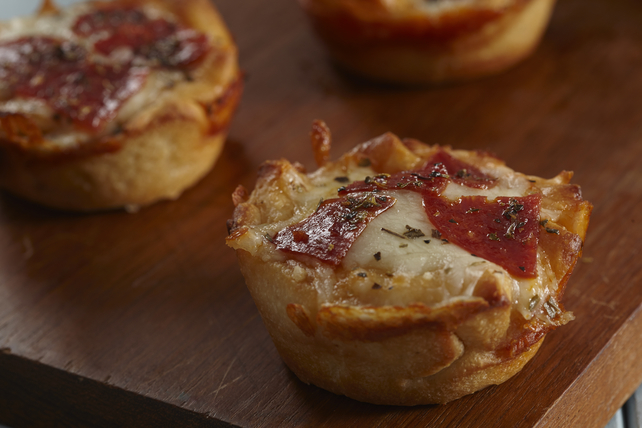 Fill each cup with 1 pepperoni slice, 1 tsp. pizza sauce and 1 Tbsp. cheese; cover with reserved dough pieces. Press edges of dough in each cup together to seal. Bake 8 to 10 min. or until golden brown. Meanwhile, cut remaining pepperoni slices into quarters. Top 'cupcakes' with remaining cheese and pepperoni; sprinkle with Italian seasoning. Bake 5 min. or until cheese is melted.